With the NGLY1 deficiency community at the SBP Rare Disease Day Symposium in San Diego. This is the first installment of a number of blog posts about rare diseases (here, here, and here). This past month I spoke at two different Rare Disease Day events about how we are using model organisms to move towards therapies for rare diseases. 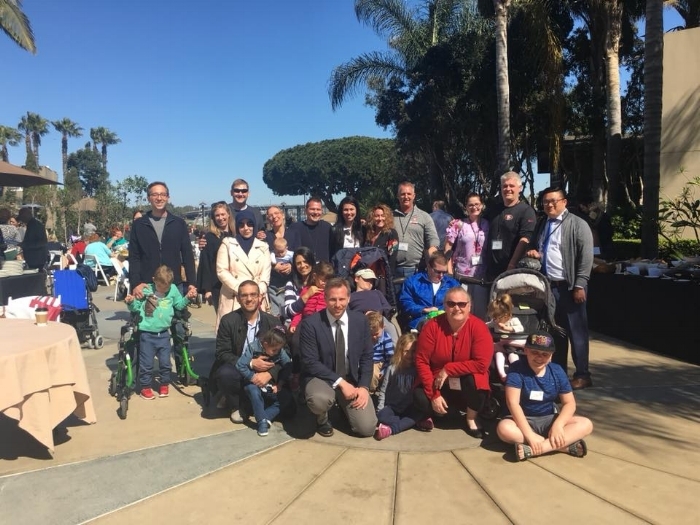 I attended the 9th Annual SBP Rare Disease Day Symposium & CDG Family Conference in San Diego and The 5th Annual Rare Disease Genomics Symposium at UAB. These were incredibly eye-opening experiences. Both have given me a lot to think about, especially regarding the direction of the lab and the relationship that science has with patients. I hope to write a bit more about these ideas over a few posts. For this post, I'll write a little about what these meetings were about and some quick lessons I learned. The SBP event was focused on bringing together physicians, patients, foundations, and scientists working on Congenital Disorders of Glycosylation and NGLY1 Deficiency. We had scientific sessions where we shared the most recent advances in our labs. I spoke about advances we've made with our model of NGLY1 deficiency. We also had an open sessions where we spoke with families and kids with rare diseases - listening to their experiences and answering questions about the basic biology and potential therapeutic advances. Finally, the scientists spent time brainstorming and sharing unpublished data, to pull together connections that may not be apparent to any one lab. The most effective part of this meeting was that patients participated in all of the events, including the scientific brainstorming session. This video captures the excitement of the meeting. The UAB event was quite different, focused on therapeutic advances and management of rare diseases. I spoke about how model organisms can really help advance therapeutic development in rare diseases. There were also sessions on challenges of finding appropriate care and how to advocate for your child with a rare disease. 1) Hud Freeze told me that meeting the patients changes your life. This is absolutely true. Meeting the brave kids and adults battling rare diseases was inspirational, especially learning about the strength that they have to fight for their lives. Putting a human face on science is important. 2) Scientists need to talk to patients. Patients and parents understand a lot more than we give them credit for. They've often read all the research and followed the science. It turns out, if you aren't trained in science, you can come up with really good out-of-the-box ideas that aren't filtered out by years of scientific training. 3) Scientists need to talk to patients. Patient experiences matter. Hearing about the conditions and struggles that they go through may give you ideas that can be pursued in the lab. Often, these anecdotes won't be documented in the literature, but reflect real experiences. 4) Basic science is essential to finding therapies for rare diseases. Because the communities are so small, patients, physicians, and scientists HAVE to work together. 5) Science needs to be open access. Patients and physicians need to be able to read the current literature. Patients are taxpayers and voters. They have a right to access work that may impact their lives. These are just a handful lessons I learned. The real highlights were the personal connections I made with patients and parents. I encourage scientists and trainees working on disease models to attend patient meetings and events. You never know how it might change your life and impact your science. And if you're lucky, you might meet someone amazing like Emily Kramer-Golinkoff, who started a foundation and is fighting for a cure for her rare disease.